← The End? Part II: Speech, Speech, Speech! Max Fisher at The Atlantic with a round-up. Sur près de 600 pages, ce document, dont Le Monde a obtenu une version quasi définitive, décrit les “violations les plus graves des droits de l’homme et du droit international humanitaire commises entre mars 1993 et juin 2003 en RDC”. Derrière l’intitulé se cache une décennie de meurtres, viols, pillages auxquels prirent part plusieurs pays de la région. Des conflits qui firent un nombre indéterminé de morts, mais qui se chiffrent au bas mot en centaines de milliers. La compilation des rapports existants et la collecte de nouveaux témoignages menée par le HCDH fournissent une base pour des poursuites judiciaires à venir contre les auteurs de ce que le HCDH qualifie de “crimes contre l’humanité, crimes de guerre, voire de génocide” après des années d’impunité. Depuis des semaines, le Rwanda déploie ses réseaux et son énergie pour tenter d’étouffer ce rapport qui risque d’atteindre le cœur du régime du président Paul Kagamé, l’homme fort du Rwanda depuis 1994. Le document estime en effet que “les attaques systématiques et généralisées [contre des Hutu réfugiés en RDC] révèlent plusieurs éléments accablants qui, s’ils sont prouvés devant un tribunal compétent, pourraient être qualifiés de crimes de génocide”. Il reste à savoir quel tribunal se chargera de cette œuvre de justice alors que la plupart des crimes sortent du champ de compétence de la Cour pénale internationale. A leaked United Nations report on the Rwandan genocide makes the explosive charge that the Rwandan Army, long credited with helping to end the infamous 1994 genocide of ethnic Tutsis, committed hundreds of acts of genocide against ethnic Hutu refugees in 1996-1997. 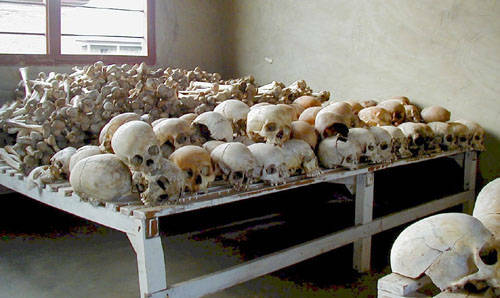 The document, first reported by French newspaper Le Monde, states, “The majority of the victims were children, women, elderly people and the sick, who were often undernourished and posed no threat to the attacking forces.” The report implicates much of Rwanda’s current government, including President Paul Kagame, in joining with Congolese rebels to slaughter Rwandan refugees who had fled to the Congo. Rwanda is challenging the accusations, saying they only attacked members of the Hutu militias responsible for the 1994 genocide. The UN report risks seriously complicating the always-tenuous politics of Central Africa, where Rwanda has become a beacon of stability. Many countries’ armies, militia groups and rebel groups were involved in the killings, and all get dishonourable mentions in the report. But attention will focus on the Rwandans, partly because they started Congo’s collapse by invading the country in 1996, but also because the present regime of Paul Kagame has been most vigorous in denying that its forces did anything wrong at all during that awful conflict, despite many peoples’ suspicions to the contrary. Indeed, Mr Kagame has generally taken a “holier than thou” attitude to the whole Congolese imbroglio, arguing that his soldiers alone had the right to act in eastern Congo, to hunt down the Hutu genocidaires who had fled there after the genocide in Rwanda in 1994. Human-rights activists have often pointed out that whereas most of the Hutu ringleaders of the 1994 Rwandan genocide have been brought to trial, no one has been found responsible for the hundreds of thousands of deaths in the Congo wars. This UN report will provide powerful ammunition to prosecutors. But its more immediate effect will be to further damage the reputation of Mr Kagame. It will be very interesting to see the reaction of Western governments to the report. Some Western politicians have become increasingly queasy about giving Mr Kagame so much aid and diplomatic help. These UN allegations could turn that queasiness into decisive action. 31. The scale of the crimes and the large number of victims, probably several tens of thousands, all nationalities combined, are illustrated by the numerous incidents listed in the report (104 in all). The extensive use of edged weapons (primarily hammers) and the systematic massacres of survivors after the camps had been taken show that the numerous deaths cannot be attributed to the hazards of war or seen as equating to collateral damage. The majority of the victims were children, women, elderly people and the sick, who were often undernourished and posed no threat to the attacking forces. Numerous serious attacks on the physical or mental integrity of members of the group were also committed, with a very high number of Hutus shot, raped, burnt or beaten. The systematic, methodological and premeditated nature of the attacks listed against the Hutus is also marked: these attacks took place in each location where refugees had been screened by the AFDL/APR over a vast area of the country. The pursuit lasted for months, and on occasion, the humanitarian assistance intended for them was deliberately blocked, particularly in the Orientale province, thus depriving them of resources essential to their survival. Thus the systematic and widespread attacks described in this report reveal a number of damning elements that, if proven before a competent court, could be classified as crimes of genocide. 32. It should be noted, however, that certain elements could cause a court to hesitate to decide on the existence of a genocidal plan, such as the fact that as of 15 November 1996, several tens of thousands of Rwandan Hutu refugees, many of whom had survived previous attacks, were repatriated to Rwanda with the help of the AFDL/APR authorities and that hundreds of thousands of Rwandan Hutu refugees were able to return to Rwanda with the consent of the Rwandan authorities. Whilst in general the killings did not spare women and children, it should be noted that in some places, particularly at the beginning of the first war in 1996, Hutu women and children were in fact separated from the men, and only the men were subsequently killed. The report goes along on that vein, describing specific examples that are devastating to read. It describes Congolese civilians packed into rail cars that became “coffins on rails,” with air supply cut off or petrol bombs thrown in. It also describes the role of conflict minerals in sustaining the warfare and chaos in eastern Congo — an issue that the Enough Project in particular has focused on. I’m still absorbing the report, and it’s worth emphasizing that it’s a draft rather than a final version. And the truth in Congo is always hazy, so this mustn’t be taken as gospel. My main hope is that the report will get more attention to the humanitarian disaster of eastern Congo. One lesson I’ve learned over the years is that it’s very difficult to solve a humanitarian problem unless it is in the spotlight, and Congo’s problem has been that it rarely gets much global attention. No country has suffered so many millions of deaths and received so few column inches of coverage. There are signs that that may be changing, and maybe this report will be part of the process. The striking conclusion is that the crimes committed by the RPA/AFDL against Hutu refugees and Congolese Hutu could constitute a crime of genocide. This will be a bombshell for Paul Kagame’s government, which prides itself for having brought an end to the 1994 genocide against the Tutsi in Rwanda and has built its reputation and its appeal to donors on its promotion of post-genocide reconciliation. This report will rock the internet for months and years to come. Its political importance is hard to overstate. Nonetheless, the mapping team’s mandate was to documents crimes of genocide, and it was rigorous: In total, the team gathered evidence on 600 incidents of violence between 1993 and 2003. Their standard was two independent sources for each incident. They interviewed 1,280 witnesses and gathered 1,500 documents. Many of the reports of killings of Congolese and Rwandan Hutu civilians were corroborated by eyewitnesses. While we always knew that there had been large massacres of Hutu refugees in the Congo, this is the first rigorous investigation, and the first time an international body has thrown its weight behind charges of genocide. Another word of caution: This is the preliminary draft. The report is due to be released on Monday, but it has been leaked, I gather because Secretary General Ban Ki Moon – or othr UN officials – has pressed for the charges of “acts of genocide by the RPA/AFDL” to be removed. The Rwandan government has reportedly threatened to withdraw its troops from the AU mission in Darfur and the UN mission in Haiti. I imagine that it is to prevent such editing that the report was finally leaked. The U.N. has so far refused to comment on the leak, except to say that the draft is not the final version of the report. The Rwandan government has rejected the report, but not said much more. But earlier this month in Kigali, top Rwandan officials spoke freely and on the record about their efforts to have the draft report quashed. Rwanda’s President, Paul Kagame, came to power in 1994 at the head of a rebel army that brought the extermination of Rwandan Tutsis by Hutu extremists to a halt. This army today is the chief contributor of troops to the U.N. peacekeeping mission in Darfur—and last month, after Rwanda received the draft report, Kagame met with the U.N. Secretary-General, Ban Ki-Moon, in Madrid, and told him that if the report came out, Rwanda would withdraw from all of its commitments to the U.N., starting with Darfur. “I was in the meeting,” Louise Mushikiwabo, Rwanda’s Minister of Foreign Affairs, told me in Kigali a few weeks ago. Mushikiwabo followed up with Ban by letter (pdf), elaborating her government’s complaint and reiterating its threat.